Jupiter (Guru) transit to Libra (Tula Rashi) 2017 prediction for Aquarius (Kumbh Rashi) Sign - Guru peyarchi palangal 2017 for Kumbh Rashi as per Thirukanitha Panchangam. In 2017 Jupiter transit to Libra (Tula Rashi) sign would happen on September 2nd, 2017 and stay there until October 4th, 2018. Let us analyze prediction of Jupiter Transit 2017 for Aquarius (Kumbha Rasi) Sign in details, so we can know what to expect. The Aquarius is the 11th sign (rasi) in the zodiac chart. The stars or Nakshatras Avittam (pada 3 and 4), Sadhayam and Poorattadhi (pada 1, 2 and 3) come under the rule of this constellation. People born under any of these stars will have Aquarius as their moon sign. Aquarians will keep their secrets lose to their heart; They keep their successes and failures to themselves like that old adage (A full vessel makes no noise). They are patient, plan strategically and win over their enemies. Lord Jupiter transited to the House of Virgo last year on August 2, 2016. Jupiter (Guru) is currently at the House of Virgo (Kanya Rashi). This year Jupiter transits to the House of Libra (Tula Rasi) on September 2, 2017 and stays there till October 4, 2018. Let us look at what last year transit brought in for you. Last year, the Jupiter (Guru) Transit was not much beneficial to you, as He had transited to your 8th House, a shadow House. Hence the outcomes were mostly malefic. Students had a tough time studying. Their anxiety over marks caused them to lose whatever they tried to score. Your health was affected too. Marital discord was on the rise. Marriages and childbirth faced delays. Thus so far you were suffering from the transit last year. So, this year’s transit will bring you reasons to cheer. The transit this year will bring you good consequences mostly this year. Lord Jupiter will transit to your 9th House (House of Libra) on September 2, 2017. The 9th House deals with dharma and ancestors. Your interest in devotional, spiritual and charitable work will rise. Your father’s health will improve. You will receive his support. You will also receive wealth from your paternal side. Lord Jupiter aspects your House of Aquarius with His 5th part gaze. This is your Jenma Rasi (Ascendant sign). Jenma Rasi indicates your mental prowess and strength. All your old fears will take leave of you. You will feel reborn and full of spirit to take on anything. Your health will also improve. Planet Jupiter aspects the House of Aries (3rd House) with His 7th part gaze. The 3rd House deals with your courage and your younger siblings. You will feel fresh and full of courage. Your younger siblings will have a good year ahead, with great progress in their life, be it, academics, work, marriage or childbirth. 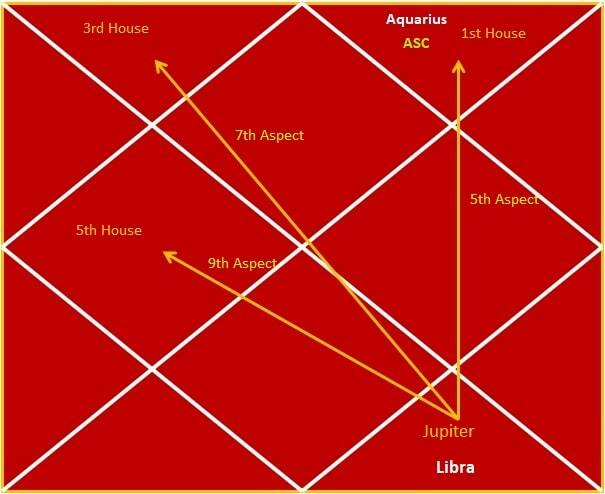 Jupiter aspects your 5th House (House of Gemini) with His 9th part gaze. The 5th House deals with your children. Your children will have a good year ahead. They will be successful in their areas of life, be ti education, work or marriage. Students will do well in their academics. They will win competitions. People at work will see progress at their jobs be it business or professional work. Those who suffered setback earlier will rise up one again. Those working for wages will receive pay rise and promotions. Marital relationships will heal. Some of you awaiting their marriages will get married. Those who wish for children will receive child boon. Money flow will be good. You will recover your lost happiness and peace.